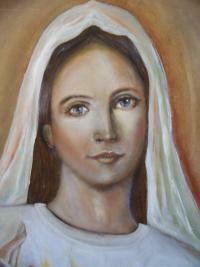 The Oil is blessed by Our Lady, and pours out in a prodigious way from Her images. Therefore, it must be distinguished from the liturgical Oil (for the Sick, of the Catechumen or Chrism), which is blessed by the Bishops and is used in the Sacraments. The first Devotion is to live the Eucharist. This is a very precise clear revelation and as regards contents speaks a lot about the living presence of Jesus in the Most Holy Sacrament of the Eucharist, the Heart of the Catholic Church. The dialogue which takes place between Jesus and Debora is defined as “the Eucharist Hymn to His Church”. Our loving Sacred Heart frequently asks us to return to the traditional way of receiving Him in your mouth of the priest after a full confession with greatest veneration and respect: in the mouth and at least after kneeling and with clasped hands. The Hearth is truly the great answer to Her who a thousand times day repeats to the Love Of the Trinity: “Until the last of My children gets in, I shall remain at the door anxiously waiting so that none of them may be lost.” How can we discover the treasure hidden within these Hearts, indicated as a marvelous weapon to rediscover values that are born in the family, the first community? When the members of a family gather together, it’s the Mother of Unity wants to stay with us “Her dear children”. She long to give us back the certainly, warmth and security we lost during the course of our lives, often led by misleading ideologies, social engagements not meant to protect the last; led by violent often passions that have an intoxicating effect and that soon wane leading a sense of emptiness and dissatisfaction. “I’m the Virgin of Eucharist” At Manduria Mary presents herself as Virgin of Eucharist, Spring of the Holy Oil of Everlasting Unction, Mother of the blessed Olive. She appears with the radiant Eucharist on Her Heart with left hand holding the Host like a small plate as if in reparation and her right hand raised with 3 fingers blessing, representing the Trinity. She gently points to Her rosary She’s holding in Her hand.